Demolished - the much altered Co-op Vale of Clwyd Farmers’ warehouse still stands amongst other industrial buildings on the Anglia Autos site. The crane from the goods shed has been relocated at the end of the railway path. Notes: Dyserth Station was located at the southern end of the 2½-mile long Prestatyn to Dyserth line. The branch had been opened in 1869 by the London & North Western Railway (LNWR) to carry lead and haematite from mines in the upper Prestatyn Valley down to the Chester and Holyhead Main line at Prestatyn. At this time there was no passenger service, but goods stations were provided at Meliden and Dyserth. As the line approached Dyserth it split into three sidings, the southernmost passing through a stone-built goods shed. The goods yard did not handle livestock but it did have a 1 ton 10 cwt crane. Towards the end of the nineteenth century there was demand for a passenger service on the line, with a petition being sent to the LNWR in 1896. The LNWR eventually agreed to this, and a regular passenger service started on Monday 28 August 1905. At Dyserth the new passenger station was south-east of the goods shed on the south (up) side of what had been the middle siding. There was a low platform comprising a single row of sleepers along the front and sides, with cinder infill to the rear, and a station sign at the back of the platform. At first there were no other passenger facilities, but within a few years two single-storey wooden buildings were erected; one came from Connah’s Quay and the other was moved from the goods yard. One of the huts was at the back of the platform and housed a booking office (the only one on the branch) and a general store, while the other was used as a waiting room and toilets. 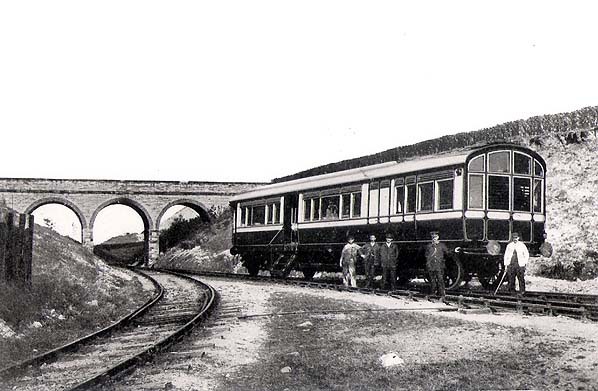 From the start passenger train services were operated by a ‘railmotor’ that ran between Prestatyn and Dyserth. Initially there were only two intermediate stopping places, at Meliden and at Rhuddlan Road. There were eight services in each direction during the summer months which reduced to five during the winter, and no Sunday service, but by the summer of 1906 this had improved to 14 trains a day in each direction. stations) and fifteen on Saturday. In reality the timetable was regularly ignored, with trains running as often as possible. In 1906, an additional station was opened at Chapel Street in Prestatyn. In 1908 an Act was obtained to extend the line from Dyserth to Marian Mills. Despite the Act being renewed the only work that was carried out was undertaken by a local landowner, a Mr Pochin. He built a short section of route on his own land in the hope of encouraging the LNWR to move the project forward. The Great War stopped any further work, and the extension was never built. During the twentieth century the brick-built Co-op Vale of Clwyd Farmers’ warehouse was built beyond the station, on the north side of the sidings near the end of the line. 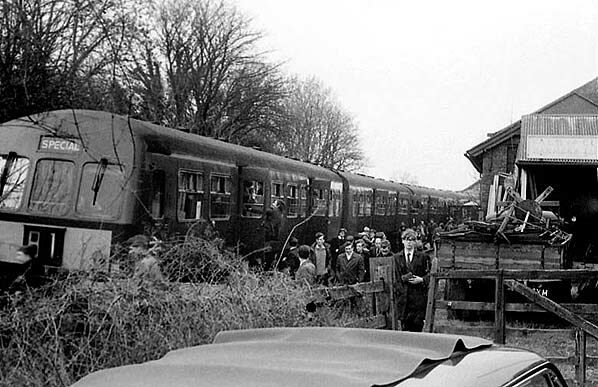 Due to an increase in passenger numbers after the war the railmotor was replaced with tank locomotives and coaches that could be operated in push-and-pull mode. On the 1 January 1923, Dyserth became part of the London Midland & Scottish Railway (LMS). During the 1920s Dyserth station began to feel the effects of competition from motor bus services. The General Strike of 1926 did not help matters as it caused even more passengers to desert the railway. Although passenger numbers were dropping in the 1920s, freight traffic remained healthy with three trains a day in 1923. 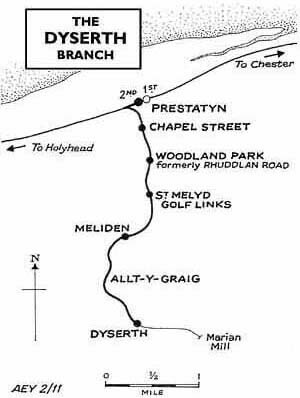 In an attempt to attract more passengers to the line the LMS opened two further stations: St Melyd Golf Course in 1923 and Alt-y-Graig in 1929. Passenger services were still struggling financially, especially in the winter months, and this led to the LMS withdrawing them on the 22 September 1930 after only 25 years of operation. The line reverted to being purely a freight route. Castle Quarry closed in 1931, and the number of daily freight trains was reduced to two. This was maintained until 1953, when the freight service was further reduced to one train a day. This followed the mechanisation of processes at Dyserth Quarry which resulted in a reduction of staff and increased use of road transport. 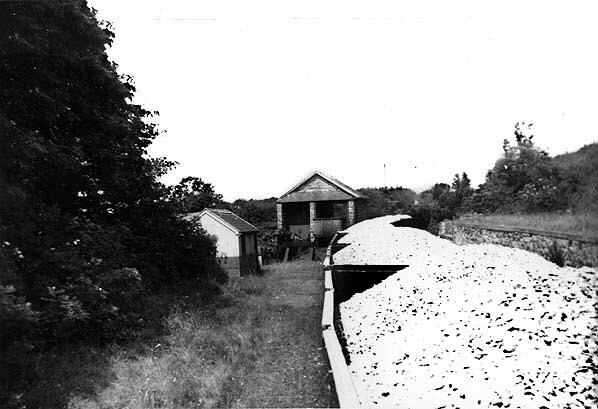 Stone trains continued to operate regularly to the station until 7 September 1973. Even after this date occasional trains still worked stone away from Dyserth, but the traffic had ceased by 1980 and the track was lifted in that year. Attempts were made to reopen the line as a preserved railway but the plans came to nothing. In the late 1980s British Rail transferred the trackbed to Rhuddlan Borough Council who developed into a footpath passing through Meliden station site. 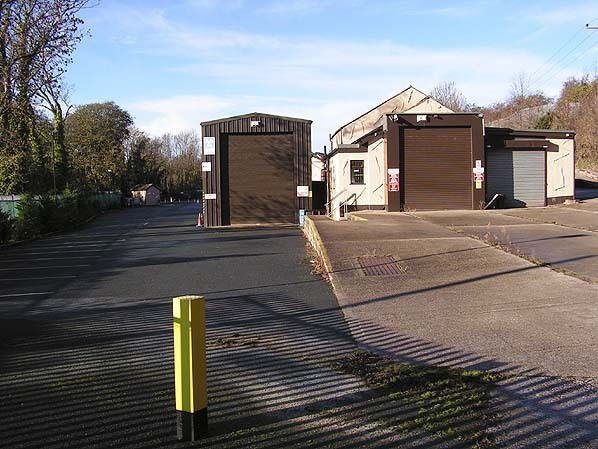 Dyserth station was redeveloped for industrial use (Anglia Autos) with the Clwyd Farmers’ warehouse retained, although now much altered. The goods shed yard crane has been relocated as a feature at the end of the railway path. Part of the site, including the station itself, has recently been further redeveloped as a small private housing estate (Anglia House). Dyserth station was served by a ‘railmotor’ between 1905 and 1919. In this view the railmotor waits outside Dyserth station as railway staff pose for the photographer in the first decade of the 20th century. The line from Dyserth Quarry works comes in from the right. 1872 1:2,500 OS map. At this time Dyserth was a goods-only station; the goods shed can be seen in the centre of the map. Although Dyserth Quarry was operating at this time, the siding to the quarry works had not yet been laid. 1899 1:2,500 OS map. A siding has now been laid to the newly-built quarry works and transhipment point on the north side of High Street. There is now a rail connection between the siding and the quarry to the south of the village. 1912 1:2,500 OS map. Dyserth station is now open for passengers. The southern siding has been shortened to accommodate the passenger platform. The booking office is seen just to the east of the truncated siding. There is a narrow-gauge rail connection across High Street to Dyserth Quarry. 1961 1:2,500 OS map. The station has now closed to passengers and is once again just a goods station. Note the addition of the Co-op Vale of Clwyd Farmers’ warehouse near the end of the line on the north side of the sidings. 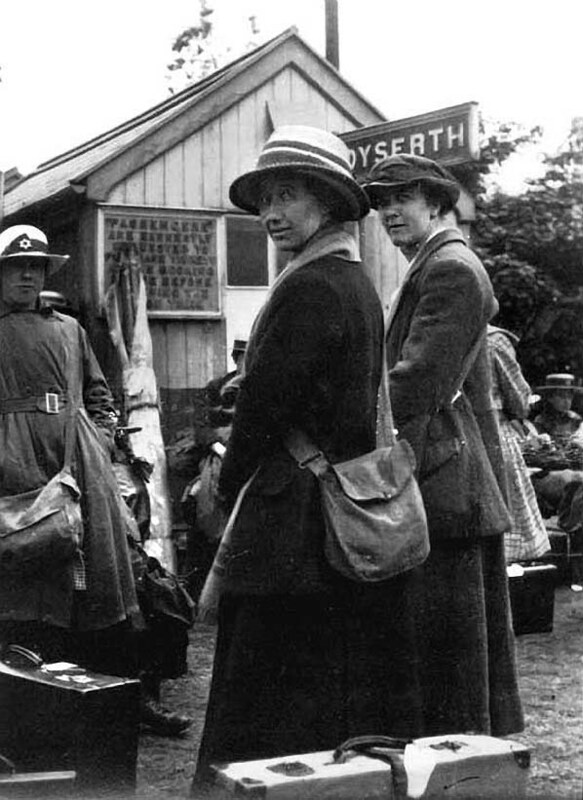 During the Great War of 1914 to 1918 two ladies from the Volunteer Aid Detachment (VAD) wait to board a train at Dyserth station. Well educated women who were living at home were typical VAD volunteers. They learned skills such as nursing and driving so that they could help the war effort. The women in the picture are likely to be Gwyneth Kermode and a Miss Roberts, a captain and a lieutenant of the Prestatyn Girl Guides. 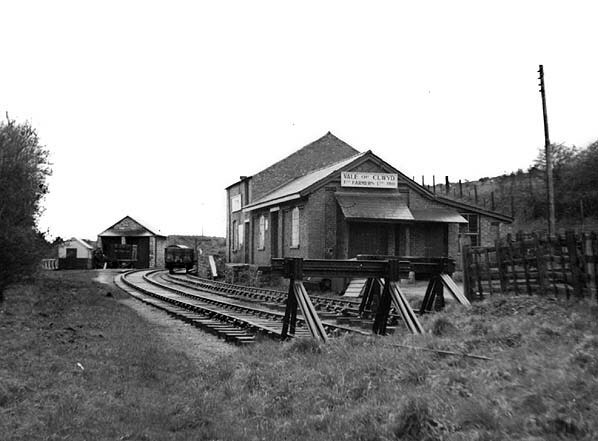 The passenger station at Dyserth in 1950. Tickets were issued from the window that can be seen boarded-up next to the door; the building was also a general store. Another wooden hut was used as a waiting room and toilet, perhaps the hut seen on the far left. The goods shed on the right dates from the opening of the line in 1869. 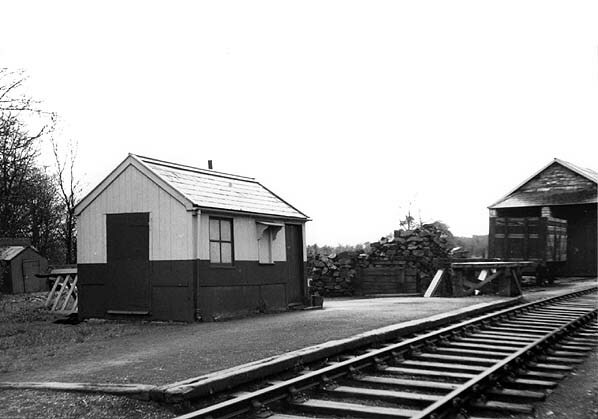 Dyserth Station from the buffer stops in April 1950. The passenger station can be seen to the left of the picture; it was nothing more than a low platform and a simple wooden hut. The building on the right is the Co-op Vale of Clwyd Farmers’ warehouse. Looking north-east at Dyserth station in July 1963. The station booking office can be seen to the left. A stone train from Dyserth Quarry waits in the siding. The quarry siding runs behind the goods shed. The ‘Welshman Railtour’ in the sidings at Dyserth on 22 March 1963. Looking south-east at Dyserth Station in December 1972. The passenger station can be seen to the right. The low platform had been removed by this date. To the left, behind the mineral wagons, the Co-op Vale of Clwyd Farmers’ warehouse can be seen. Regular daily stone trains continued to work from the station at this time. Dyserth Station looking north-west in October 1979. The wooden passenger station building was still standing after nearly 50 years of closure. The sidings at the station had seen regular rail traffic until 1973, and, although the track is still in place, it is heavily overgrown and not visible. 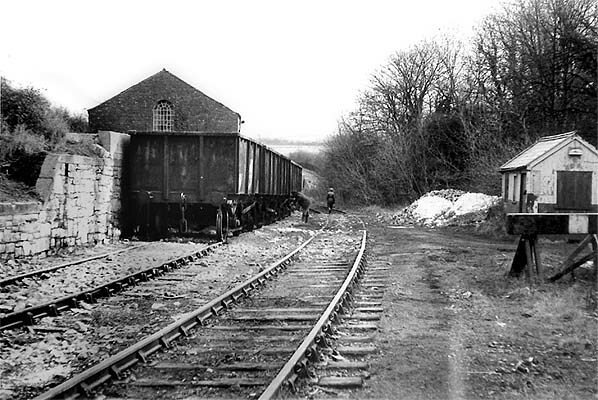 At this time the quarry line running behind the goods shed still saw occasional traffic; it was not lifted until 1980. 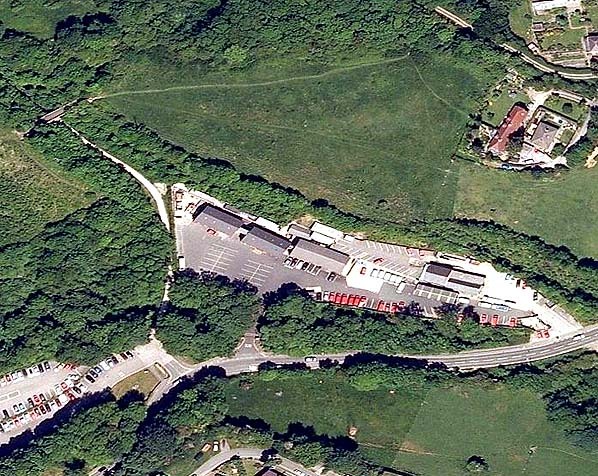 Aerial view of the station site in the mid-2000s. The railway path can be seen coming in from the top left, passing under a bridge. As it approaches the station it is diverted to the south along the old quarry siding to reach the road. The old goods shed crane has been relocated to this point as a feature of interest. A short approach road to the station forecourt can be seen below the yard. 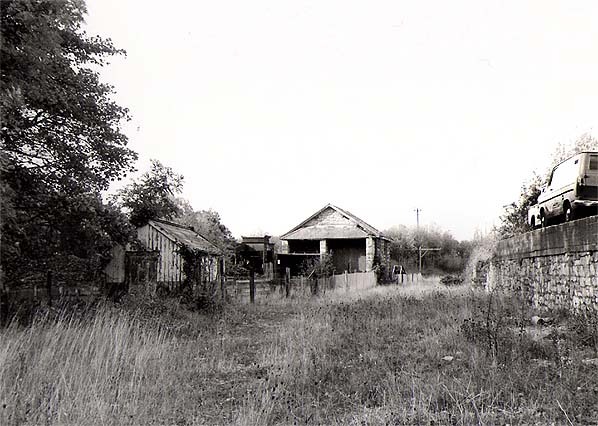 At the end of the approach road the goods shed was straight ahead, and the booking office was to the right. A small private housing development (Anglia House) has now been built at the end of the approach. The Co-op Vale of Clwyd Farmers’ warehouse (the only railway-related building still standing) is seen to the right, near the road.